We all love the idea of convenience and our fingertips, which is why having a home that gets smarter by the day is just the thing that many people are looking for these days. Switchmate revels in the thought of working with connected home products wirelessly through the simple to install and activate SimplySmart Home. The whole point of the SimplySmart Home is to create a modern, automated home without having to perform any kind of messy rewiring jobs, or simply to replace anything, through the availability of its new Cube wireless home security camera. The Cube wireless home security camera requires a grand total of one to two minutes to install, now how about that? It brings with it doorbell functionality, voice and motion activation, as well as a battery life that is able to last for an entire year. This allows the Cube to empower just about everyone, ranging from tech enthusiasts to tech newcomers, in order to experience the improved safety and security a connected home provides. 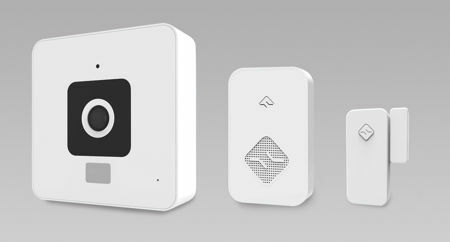 The Cube is a wire-free HD home Security Camera with two-way audio and doorbell, being part of the SimplySmart Home family of high quality, fully featured connected home products which are constantly touted to be installation-free and wireless in nature. It comes with power outlets that have a pair of independently controlled sockets as well as built-in voice control. You do not even have to replace your existing doorbell, and you also get additional peace of mind courtesy of free 7-day video storage, making it deliver plenty of bang for your hard-earned buck. Being weatherproof allows it to be installed virtually anywhere, and it works great even at night thanks to its night vision capability at 1080P/720P high-definition resolution. Expect it to retail for $149.99 apiece.